Due to high detail, maps have very large digital images. Medium resolution 482 kB The 1952 map shows only one freeway, the Gulf Freeway. The Baytown tunnel is shown as being under construction, with a Fall 1952 opening date. 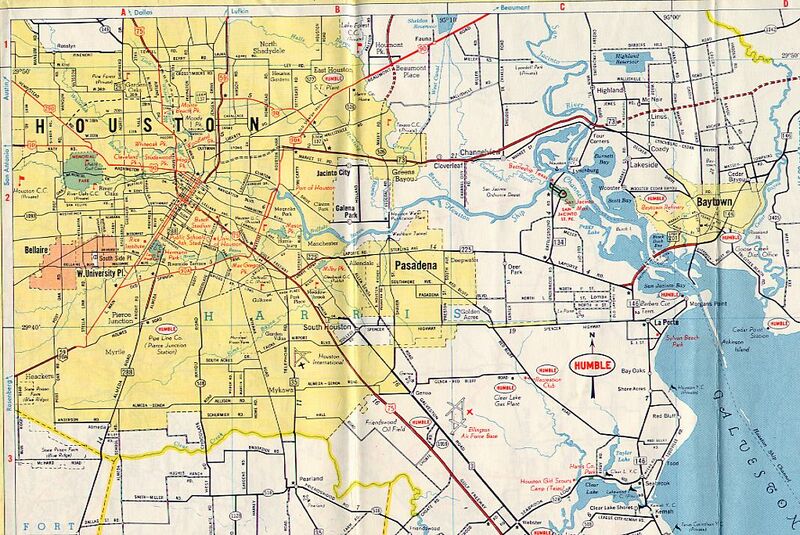 Most interesting, however, is the large Sam Houston Airport shown in southwest Houston along South Main (US 90A). 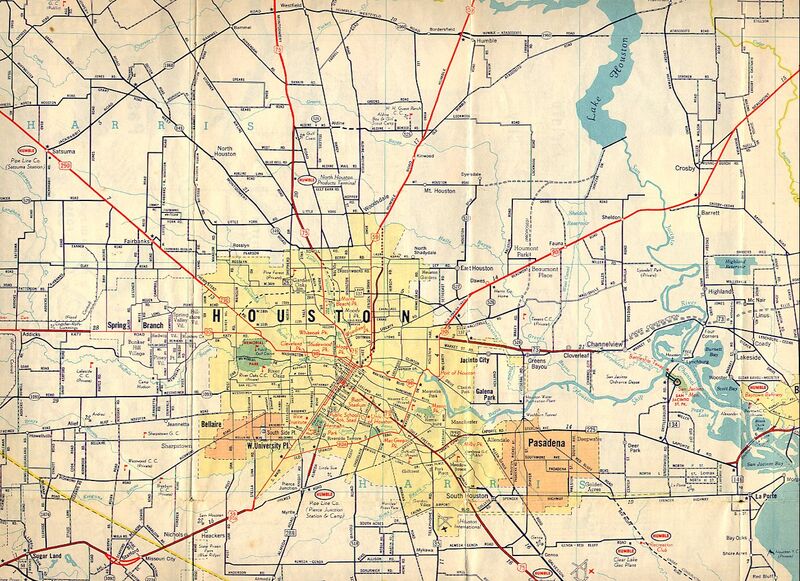 If this map is correct, it was on a large tract of land, nearly as large as Hobby Airport. The tract would become the Westbury real estate development. 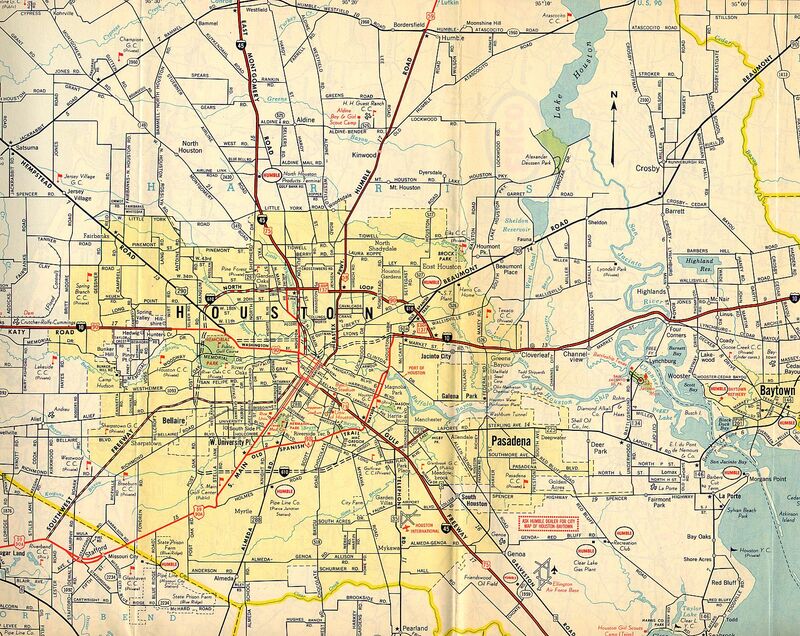 Medium resolution 434 kB The 1955 map shows several major highway sections in place. The heavy red line designates a divided highway that is not necessarily limited access. Medium resolution 258 kB The 1958 map shows few changes from 1955. The route of the north loop, Loop 137, is now shown as a dashed line. 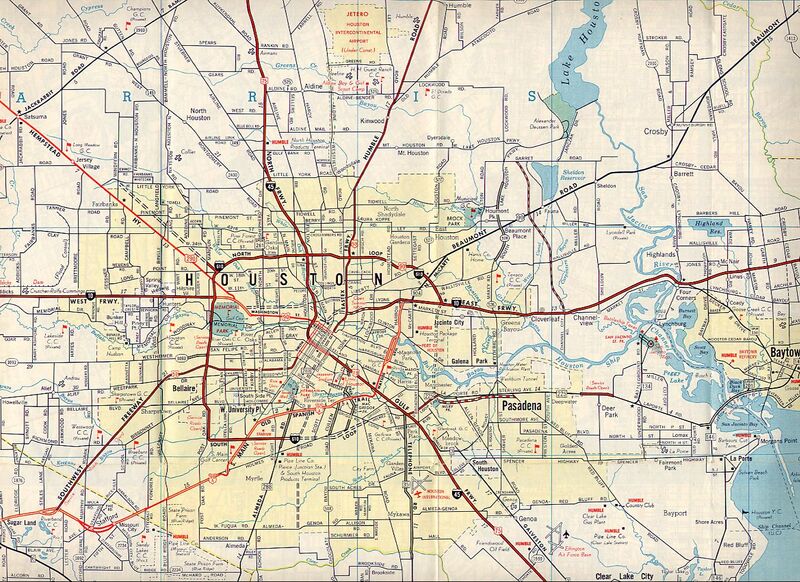 Medium resolution 397 kB The 1961 map shows the full length of the Southwest Freeway under construction. 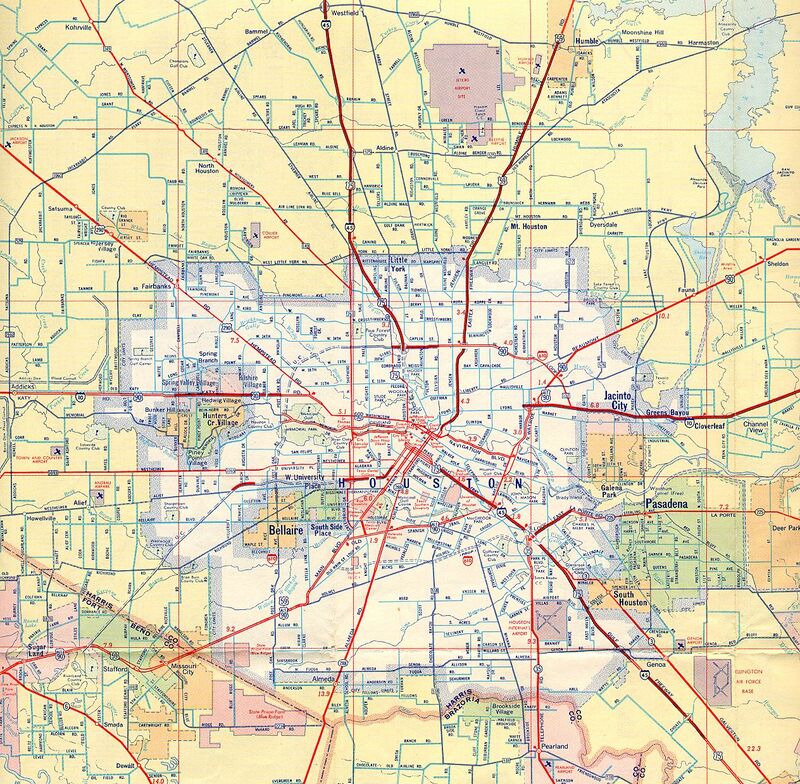 Large sections of the Southwest Freeway would be completed that year. 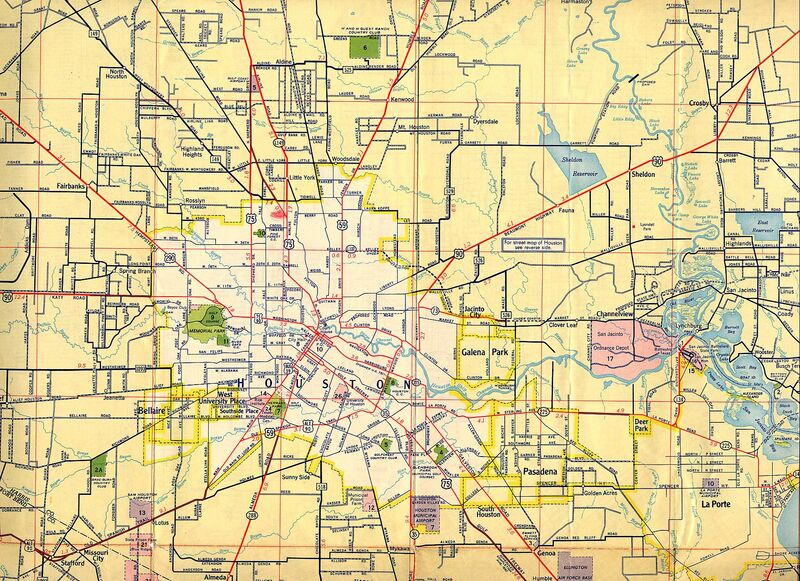 The map also shows the planned routes of IH-10 through Houston and the South Loop. 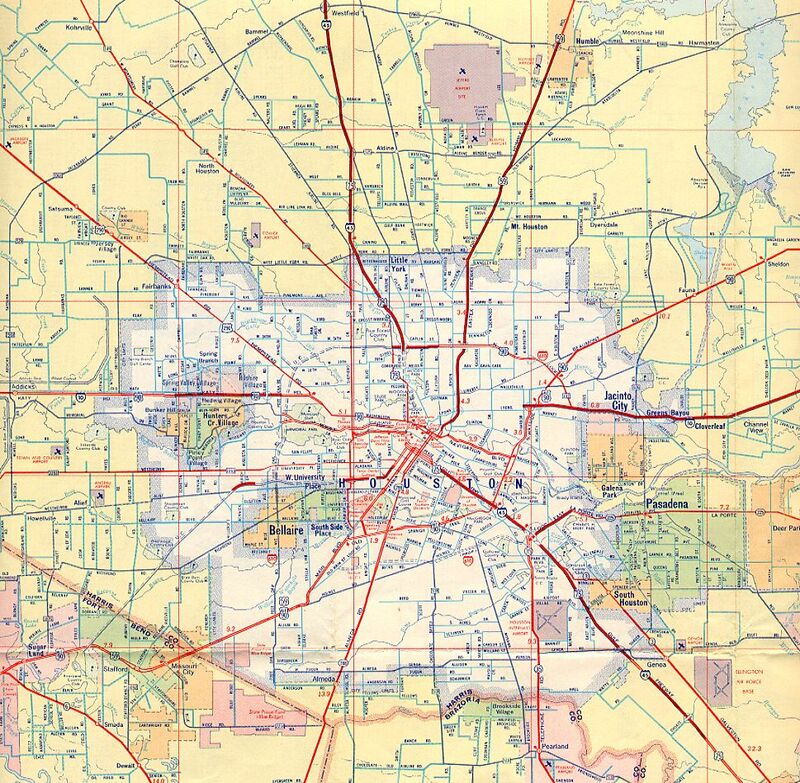 As with the 1952, 1955, and 1958 maps, the heavy red line does not necessarily indicate a limited access facility, since the North Loop near US 59 (the Kelly road alignment) was certainly not limited access. Medium resolution 336 kB This is the first map the correctly differentiates between limited access freeways and divided highways. This map shows a good shapshot of the completed freeways in Houston in 1962. Note the site of Bush Intercontinental Airport is designated as "Jetero Airport Site." I'm glad the "Jetero" name didn't stick, although one of the main roadways into the airport was named Jetero (now called Will Clayton Parkway.) 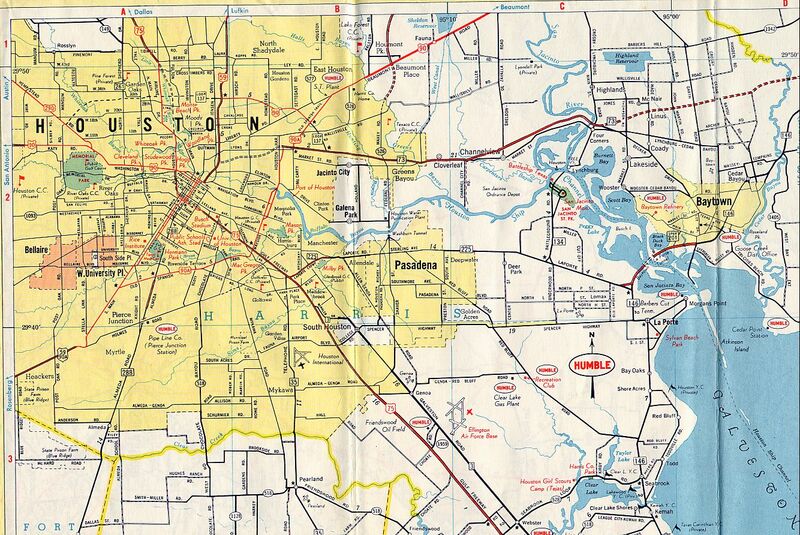 Also note Town and Country Airport on Dairy Ashford north of Westheimer. Medium resolution 479 kB In this 1965 map, Humble Oil is correctly differentiating between freeways and highways. Note, however, that many of the freeways (including the West Loop, South Loop, and Southwest Freeway) are designated as "Service Roads Open." The airport site is still designated as "Jetero Intercontinental Airport."